Information and Technology Services (ITS) continues to work with BlueJeans Network to deliver industry-leading videoconferencing, content sharing, and real-time video to the University of Michigan. BlueJeans is U-M’s preferred conferencing service and is available today at no extra cost to your unit. Register for an account at umich.bluejeans.com and click Login. If you are using a MiWorkspace-enabled machine, visit the MWS Software Center to install BlueJeans. Instructions for Windows users and Mac users. On your personal device, visit bluejeans.com/downloads. Click download, open the installer, and follow the prompts. Michigan Medicine users will have the updated software installed automatically on their managed devices. Log in with the U-M BlueJeans account you created in step 1. Note: BlueJeans requires special permissions with macOS Mojave. Learn more. Looking for training or support? For information about training resources, email HDVideoconferencing@umich.edu. For support, contact the ITS Service Center. Units that are outside of the scope of ITS, or that need classroom BlueJeans support, should contact their local units. Michigan Medicine users should contact help.medicine.umich.edu (Level 2 needed) or 6-8000. 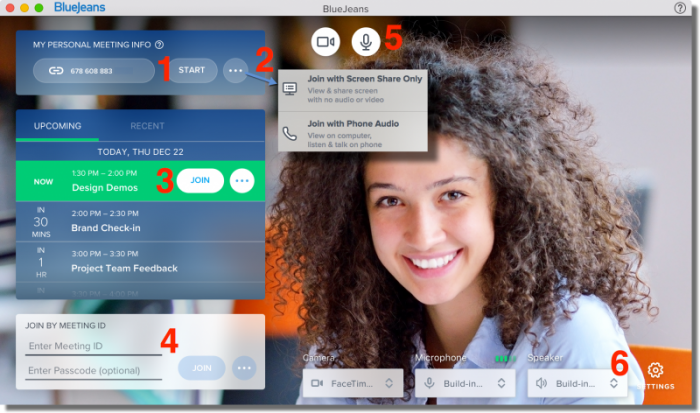 A special type of meeting, called BlueJeans Events, are not yet integrated into BlueJeans version 2.8, but a separate app is available—visit bluejeans.com/downloads and scroll down to Tools. Participants can also simply join BlueJeans Events from a web browser. BlueJeans Events provide a more controlled environment in which moderators can mute or promote presenters and stream to thousands of passive viewers. Why use BlueJeans at U-M? Units cover the cost — Most likely, your unit already pays for it. The cost to cover BlueJeans is billed to participating units. HIPAA compliance — BlueJeans can be used to discuss Protected Health Information, like patient names, thanks to an agreement between U-M and BlueJeans Network. Works with Weblogin — No need to create a separate account: log in with your U-M uniqname and Level-1 password at umich.bluejeans.com. Trusted relationship — ITS has negotiated a data protection agreement with BlueJeans Network, and also ensured the service works across the U-M community. Recorded meetings — Capture and share audio and video from any BlueJeans meeting. See a comparison of videoconferencing tools to learn more.